In the basement of Byerly Hall in the Radcliffe Yard, Elise Adibi, a New York-based artist whose works have been exhibited throughout the United States, makes metabolic paintings that challenge the boundaries of the visual. Moving from oil paint and linseed oil, she combines natural plant oil, urine, gold, copper and graphite to generate formally engaging, conceptually stimulating work. In its Fall 2013 issue, The Harvard Advocate published one of her Aromatherapy paintings – paintings that are ephemeral, amorphous in shape and exude elegant aroma. Harry Choi ’16 had a conversation with Adibi about her work, in the studio that was once occupied by Amy Sillman — one of her former teachers — but now smells of jasmine, sandalwood and lavender. Harry Choi: I am curious if you find your works to be in conversation with contemporary dialogue on painting – the repeated declaration of the death of painting, its relevance in the face of the emergence of conceptual art, or to put it more simply, doubts on painting’s ability to “express” an idea. How do you situate yourself as a painter in the context of this theoretical perspective? 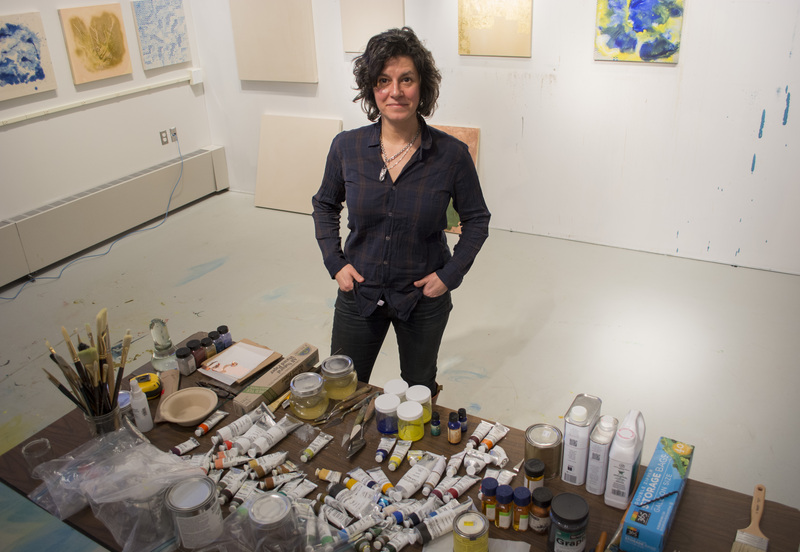 Elise Adibi: I feel very lucky to be making paintings now when it is such a fresh and expansive time for the medium. The “conceptual turn” and the post-modernist critique of the 80’s and 90’s cleared room and created new possibilities for painting, When I started my MFA at Columbia in 2005, I had studio visits with critics who were in disbelief that I was making grid paintings. Several people told me that the grid was a dead end. Many of them were painters who had emerged in the 90’s, and at that time, making grid paintings had a very different meaning. I am so grateful that I am painting in the 21st Century. I think that through the post-modern critique painting has been renewed. HC: How did you get into painting? Did you always want to become a painter? EA: Painting came to me through other interests; Actually, I didn’t like my first oil painting class when I was 11 or 12 at all. I wasn’t interested in trying to make a copy of something that already existed, or make something “look like” something else. In college I wanted to be a philosophy professor and then an architect. It was at Penn’s architecture school that one of my professors suggested that I might actually be an artist. I was very moved that this teacher recognized me as an artist, for sure, but I thought to myself: “Being an artist sounds hard and painful! And so subjective. I would rather stick with architecture.” But by then, it was too late, and the seed had been planted. That’s how I got to painting – life led me to painting. HC: What were your primary interests? Do you think that they still affect your work? EA: I studied philosophy at Swarthmore as an undergraduate, in a really rigorous, cerebral environment. What I learned through philosophy was very appealing to me — the kind of connections that you have to make between disparate thinkers and texts, my favorites being Kant, Hegel and Nietzsche. During college I thought that I would become a philosophy professor. But after college I worked in public TV (actually here at WGBH) and then got into urban design working for a professor at Harvard’s Graduate School of Design. That’s how I ended up in architecture school, where I realized that I wanted to become an artist. When I first started making work, I wanted to do both architecture and fine art. I was making installations in relation to specific sites, a lot of which had to do with light — camera obscuras, windows and such. But these works, in the end, seemed all about painting. Painting was perfect in terms of representing the process of making. It’s what’s most effective in expressing my interests that have been always in me. I still do read philosophy these days and I do feel that it is an important field for me. It does not form a one-to-one relationship with my work, and I don’t want my work to exemplify philosophy, but it is definitely a part of the conceptualization process. My first solo show, for instance, was called “A Priori”, a Kantian term. Phenomenology has also been a lasting interest, especially the role of perception. I titled my project at Radcliffe “Painting as a Site of Resistance,” and I proposed to make “Slow paintings that engage in a process of temporality and embodiment, which inhibit easy translation into forms of reproduction and image dissemination, since they are made to be seen in person.” This proposal turned into my show here called “Metabolic Paintings.” One of the Aromatherapy Paintings from the show was featured in The Harvard Advocate. HC: The painting that was published in The Harvard Advocate is interesting in the way that it touches upon viewers’ olfactory senses. What was the drive behind these paintings? EA: When I moved to Los Angeles after living in New York City for eighteen years, it felt like I had a sensory re-awakening. Spring starts in LA in January and by mid-February, the entire city smells like jasmine. And the orange blossoms, eucalyptus, lavender…. For an east coaster it felt like I was on a different planet. I started noticing people’s fragrances — people in LA wore much fresher fragrances than people in NY. I got some essential plant oils to make my own fragrance. When I got the Pollock-Krasner Grant, I left LA to go to Pittsburgh where I could live more cheaply and use the grant to make paintings. I got there in May and spring was in bloom– I had this strange experience of having six months of spring. It was in Pittsburgh that I got this idea of adding the plant oil with oil paint and combining smell and color. It just happened. But as soon as I got the idea, I realized it was huge. HC: So nature was a critical source of inspiration. EA: I think the concept of nature affects me in a more existential sense than a literal sense. Of course, when people look at the checklist for my show and see the materials used in the paintings, they’re going to think that I am very much invested in nature — the use of rabbit skin glue, urine, plant oil and such. More so than the material, though, I put importance in the experience of seeing my works. That is the reason why I want people to look at them for a while and really engage with them. My paintings are always in a process of “becoming” and they are, in some sense, recreated with each viewing. I see them as “actants,” which, according to Bruno LaTour, is “something that acts or to which activity is granted by others. It implies no special motivation of human actors, nor of humans in general.” I am very interested in this human/non-human subjectivity in my paintings. HC: Do you consider your grid paintings from a similar standpoint? EA: I actually don’t think that grid paintings necessarily are “opposed” to the concept of nature, as they might seem. Rosalind Krauss once wrote, “In the spatial sense, the grid states the autonomy of the realm of art. Flattened, geometricized, ordered, it is antinatural, antimimetic, antireal,” but the grid has historically been presented in relation to nature. Mondrian’s abstract language started with trees and the ocean and Agnes Martin once named her geometric paintings with words such as beach, island, and desert flower, though both Mondrian and Martin renounced their connection to nature at a certain point. With the grid paintings I have a firmer sense of how the finished product is going to look like, but then again there is so much chance in grid-making as well. This apparent opposition is one that I don’t want to solve, something that I want to continue to explore. These seemingly disparate works also show how process is such an important factor in my works. HC: Do you think that a similar force is at work with your oxidation paintings? EA: With oxidation paintings the process is such an important factor. They are so vulnerable — slight alterations in light and moisture will change them in unexpected ways. With other paintings, things are done when your paint dries up. With these, the possibility of changes and the unexpected nature of the changes all constitute the process. HC: While the “incompleteness” that stems from possibility of alteration constitutes the formal aspect of the oxidation paintings, thematically, they are an interesting subject to consider within a broader art historical narrative. Andy Warhol made paintings out of urine. Eva Hesse’s sculptures are associated in terms of “écriture feminine” – the inscription of the female body. EA: Eva Hesse is actually a huge influence on me, although she explored materiality in this uniquely idiosyncratic, personal way. One could say that there is an obvious connection between us, given her use of grids and examination of materials. I love that my work can provoke such questions on feminism and gender. Part of the reason why people raise such questions would be that my works are about the binary relationship between the grid and the body, which do not negate each other but coexist. HC: I think co-existence is not only an important word to describe your oeuvre, but also with regards to your role as a research fellow at Radcliffe Institute. What do you think of Harvard as a place to create art? Can art making and institution coexist? EA: It’s amazing to get such extensive support from Harvard; I feel so lucky to be here because of the quality of resources that I have access to. Other research fellows have been influential to my works as well. The writer, Lewis Hyde, for instance, showed me how to use gold leaf and I am now making 24k gold leaf paintings which will be shown in New York this fall. The most basic thing, though, is being able to do a show that is not commercial. I had this idea of creating a wooden floor, and the Institute was doubtful at first, but people loved it and they’re keeping it for a while. People are thinking about Kant and graphite with me here. I love it.